Everyone who has an interest in cricket must be aware of this fact that when Chris Gayle comes on field it came hard to resist for the opponent team, but wait this video shows the other side of veteran Cricketer who is famous for his outstanding performance in the world cup to IPL, everywhere. In the video, a lady interviewer tried to interview him before the match but what she got as response she has not ever imagined for. She was asking for his performance but Chris has taken it a little personal and started flirting on screen. He said that he was there to see her eyes for the first, after listening special comments from one of the world’s best cricketer; lady started blushing out. Not just that, he has even asked the interviewer for a drink after the tournament. But wait, everyone is not happy with his extraordinary response to the lady. 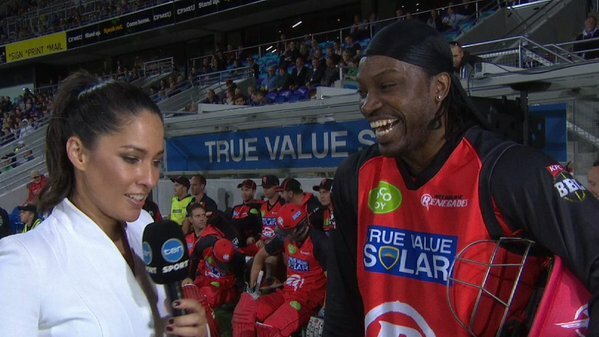 According to a report in Independent, ‘Social justice warriors angry with Chris Gayle for flirting with a reporter should remember Maria Sharapova did it first’. According to a report of BBC, Ten Sport’s Melanie McLaughlin was asking him about his aggressive batting style after scoring 41 runs in 15 deliveries. Next article‘Bigg Boss 9’ Episode 85 – 4th January 2016: BB9 Updates; Priya Upset With Mandana, Will she nominate her ?